I started working on this winter baby girl last night, but didn’t get a chance to finish her as I was distracted by the season premiere of Heroes. I’m totally hooked on that show. Every episode feels like it could be a movie. And this season (the 3rd) has already introduced a whack of new characters. Definitely looks to be a twisty turny exciting season. Yay! 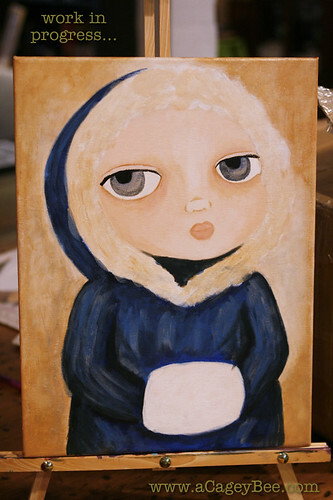 I decided to snap a pic of my winter girl anyway, to share the process of painting. The fur around the hood needs several more layers of white to get fluffy and stand out from the background. She needs more depth in her face and detail in her eyes. The coat is still a mess of deep layers and the muff has hardly been touched. As you can tell, I like a lot of layers! The other different thing about this painting is it’s the largest one I’ve done on canvas so far. I’ve painted larger scale stuff on paper (like my other winter girl) before, but never on canvas. This one is only 16″ X 12″, so hardly “big” in terms of gallery paintings, but still bigger than what I’ve been using for my portraits. I’ve had to get up a few times to look at her from a distance, but the plus side is I can really get into detailed areas like the eyes without hunching over my canvas with a teeny tiny brush. The bad/good news is I’m out of canvases now, so I may have to pick up a few more this size. Or bigger!